Advanced Reports have been greatly improved with the latest version of TrakIT. A number of options offering finer control over report generation have been introducded. Alignment: Users can now choose or force the alignment for every field in the report for greater legibility. Fields can be left-justified, right-justified or centre-aligned. If no alignment option is chosen for a field, the formatting may be differ based on the type of data. For example, Excel will align numbers to the right and text to the left by default. Select 'Group' option if you want the data grouped by a specific field. The field appears as a full row and is removed as a column. Sorting on this column takes precedence over other fields. Select 'Sheet' option if you want to completely separate the tables based on a specific field. In HTML, the table is split into several tables. In Excel, several sheets can be created based on the field value with each sheet representing one value of that column. The maximum limit of sheets in 100. Sort Priority: Users can select up to 3 levels of sorting for their reports. For any field, they must select the sort order as appropriate: 1st, 2nd or 3rd. Report fields will be displayed as per the sort order. These formatting options used on report fields will reflect across all subscriptions. Please note that these formatting options have no effect whatsoever on subscriptions where the Report Type is CSV. CSV, by definition, cannot contain formatting information. If selected, the relevant fields are highlighted in a light red color. If the first option "Since last Report emai" is chosen and the last report email was sent more than 7 days ago, no fields will be highlighted. 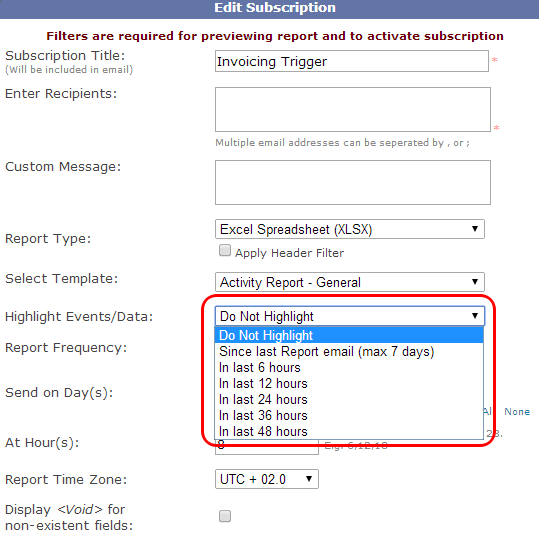 This feature is only valid for Event and Data fields and not applicable to Header and KPI fields. Again, this highlighting will not work for CSV reports. For further assistance or queries, contact TrakIT Support. TrakIT can now import shipments from Damco's Kewill Freight Forwarding system (KFF) using a specially designed Excel template. This enables users to create and update shipments in one go. Users simply need to fill up the excel file with their shipments. TrakIT will automatically create new shipments (work orders) or update existing shipments. Each line in the excel sheet refers to a shipment and not a work order. Thus, each line in the excel sheet can create or update one or more work orders with the relevant data. The Excel template has the following fields. An explanation of the fields is also provided on the second sheet, titled "Guidance", in the work book. Corridor Code: Specify the Corridor Code here as it exists in TrakIT. New work orders that are created, will belong to this corridor. Customer Code: The code specified here must match the customer code as defined in TrakIT. The Shipper/Receiver field of new work orders will be assigned to this customer. Kewill Booking Number: The booking number specified here will be assigned to the new work orders. Container Count: Specify the number of containers/work orders to be created (or updated) here. Transport Document: It must be provided if present in KFF. If left blank, an auto generated number prefixed with 'TBA' will be assigned. Carrier Code: Provide a code that exists in TrakIT. Container Numbers: Enter comma separated container numbers here, otherwise auto-generated numbers prefixed with 'TBAU' will be assigned to the work orders. The number of containers here must match the Container Count column. Container Types: Provide comma separated values for container type codes here. The number of codes here must match the Container Count column. Shipment Type: The specified shipment type will apply to all new work orders being created. Commodity: Specify the commodity that will be assigned to all work orders. Shipper Code: This field (if available in the Work Order Data) will be filled with the value provided here. Consignee Code: This field (if available in the Work Order Data) will be filled with the value provided here. Kewill Export Job Number: This field (if available in the Work Order Data) will be filled with the value provided here. Kewill Import Job Number: This field (if available in the Work Order Data) will be filled with the value provided here. All the fields are not mandatory. Specifying only mandatory fields will also suffice. Once the Excel template has been completed, just email it as an attachment to trakit@damco.com with subject as TrakIT Kewill Import. After a few minutes, you will receive a response email from TrakIT with the result of the import for each line in the Excel sheet. For further queries or assistance, please contact TrakIT Support.